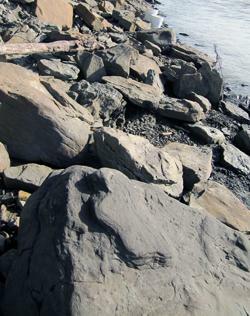 An expedition in the remote heart of Alaska has made an unprecedented find for the Last Frontier: thousands of dinosaur tracks, of countless sizes and as-yet unnamed species, all along the rocky shores of the Yukon River. 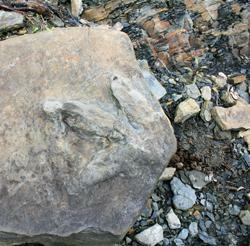 The unusual tracks aren’t imprints, but rather casts — fossils of sand and other sediment that washed into fresh dinosaur footprints and were left behind when the outer rock eroded away. 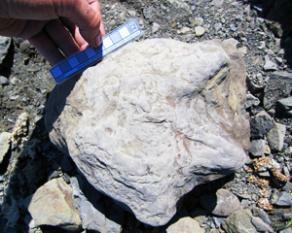 Paleontologists with the University of Alaska at Fairbanks who were on the expedition estimate the tracks are 90 million to 100 million years old — far older than any others found in the state — and many seem to belong to dinosaurs never before recorded in the region. The prints include both the familiar three-toed traces of meat-eaters and the broad, short-toed imprints of lumbering herbivores. But the tracks are so diverse and so great in number that it will likely take years to record and document them all. “We found dinosaur footprints by the scores on literally every outcrop we stopped at,” said Paul McCarthy, a University of Alaska geologist on the expedition, in a statement. The expedition, which included scientists and officials from the University of Alaska’s Museum of the North and Norway’s University of Oslo Natural History Museum, embarked in July to explore 800 kilometers of the Yukon and Tanana rivers. The geology of the valleys made them likely candidates for large fossil caches, but many of their remote reaches had not been explored by paleontologists. Though the details of what the team has found will take years to tease out, it already seems to be one of historic proportions. “There aren’t many places left in the world where paleontologists can just go out and find thousands of dinosaur footprints,” Druckenmiller said.